A great new guest recipe. Lunch time is always the best time. Especially when I have this bowl of goodness eating healthy can be simple and quick like this bowl. 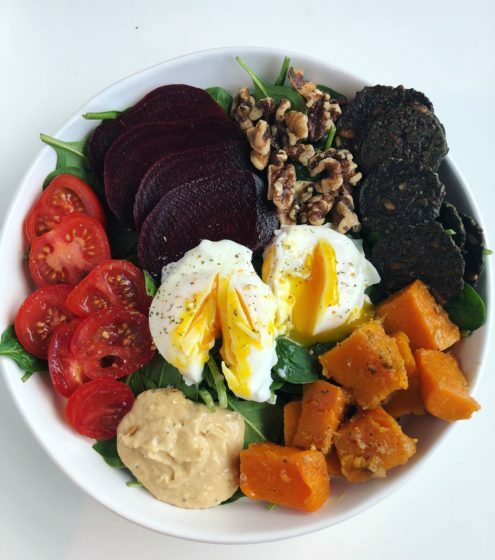 In this bowl is organic mixed greens, cherry tomatoes, sliced beets, walnuts, butternut squash, @hopefoods hummus, @marysgonecrackers, and 2 organic poached eggs Topped the eggs with some spiced and it’s ready! This all took 10 minutes and tasted delicious!